The two most dissected young people of 2013 show how this country eats its young. No two people could conceivably be more different than Johnny Manziel and Trayvon Martin. But despite the chasms that separate them of race, class, fame and, of course, the very gift of life, they’re united in cruel irony. They’re united in the ways this country seems to take a particularly savage joy in eating its young. We don’t treasure our youth. We criminalize them. We exploit them. We deify them. And then we dispose of them. Each young man has a narrative that tells this story. Manziel, the Texas A&M quarterback, became at age 19 the first freshman college football player in history to win the Heisman Trophy. Trayvon Martin at age 17 was stalked and killed by George Zimmerman for being one of those “punks” and having the misfortune of walking in his deadly line of vision. Johnny Manziel has every twenty-first-century privilege to an almost comical degree. He’s a young, white quarterback in Texas who hails from a wealthy oil family. Think about that quintet: fame, money, youth, whiteness and football. In this culture, that amounts to royalty. Tom Wolfe wouldn’t have the stones to create such a satirical archetype. Trayvon Martin had none of these things, other than his youth, and ended up dead as a result. And yet, while their differences say a great deal about this country, their sole similarity, symbolized by that shared love of Skittles, tells a story all its own. For those who haven’t been following the Johnny Manziel off-season soap opera—recounted brilliantly in Wright Thompson’s detailed piece in ESPN the Magazine—the young man with everything seems to be losing his grip one inebriated tantrum at a time. He’s being torn to bits by the media for basically being an all-too-typical over-privileged 20-year-old. He gets drunk. He gets in bar fights. He has a temper. He gets arrested. Being wealthy and white provides space for Manziel to be all these things without ending up like Oscar Grant. But being a typical over-privileged 20-year-old and a college football cash cow has created an entirely different set of pressures. 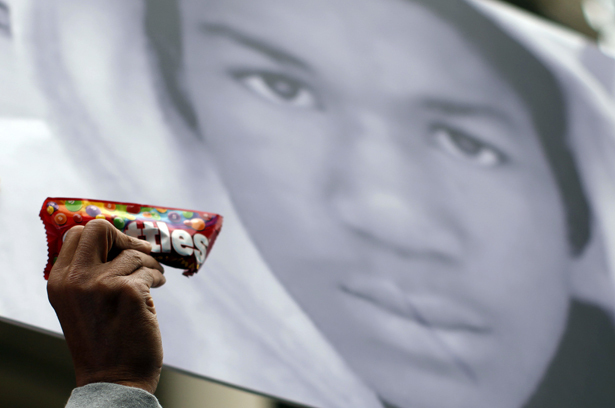 Trayvon Martin also ate Skittles but his drink of choice on the night of his death wasn’t beer but Arizona Ice Tea. None of that mattered. The Zimmerman trial became “the Trayvon trial” as his youth was put under the ugliest possible microscope. Think about the strategy of the Zimmerman legal team in defending their client’s right to “stand his ground” and shoot to kill. They put every aspect of a typical teen’s growing pains up for public consumption and scorn. Trayvon’s social media posturing, his shirtless photos, his style of dress were all presented as reasons why he should have been perceived as a threat. They subjected him to a level of scrutiny that frankly few of us would have survived at a similar age. It was an obscenity to see a dead teenager—unable to defend himself—put on trial for the grand purpose of keeping his killer out of prison. What’s happening to Johnny Manziel is profoundly less serious, but the canyon-sized differences also shouldn’t blind us to that one similarity they share. We live in a culture that reveres, worships and commercializes youth, while simultaneously being a country that eats its young. Johnny Manziel is being eaten figuratively. Trayvon Martin was destroyed literally. How much better the world would be if we could see young people as a resource to build a better world instead of as the projection of our own worst fears and instincts. Then maybe Johnny Manziel just plays football and the media find something more useful to fret over than a 20-year-old’s Instagram account. Then maybe George Zimmerman drives up to Trayvon Martin in the rain, and offers him a ride home. Bradley Manning was found not-guilty of aiding the enemy, but he still faces up to 136 years in prison.